TALLAHASSEE, Fla. — Taking pain management to a place that's out of this world. Tallahassee Memorial Healthcare is using virtual reality to distract children while they're going through painful treatments and procedures. Calming children and helping them get through tough times by immersing them in a different place. 15-year-old Grace Kerwin is one of hundreds of kids and teens using TMH's virtual reality program. "If I'm stressed out I can use that to help be somewhere else. It's like you're actually in a different spot because it takes all your vision so it really does feel like your somewhere else," said Grace. Grace was diagnosed with juvenile dermatomositis when she was 9 years old. Every month she spends 24 hours at TMH getting blood drawn. "It's super rare. Only 3 in a million people get it. It's where my immune system attacks my muscles and my skin," said Grace. "If I would've had this whenever I was first diagnosed, I could see how it would've been able to help a lot because I was super young and it was all so new to me." Grace says one of her favorites is a V-R game where she moves her head around to knock over teddy bears. Once she puts on these googles, she escapes from her treatment into a different world. And this form of treatment is showing positive results. Children have less anxiety, manage pain better and recover quicker by using applied V-R, according to pediatric clinical trials. 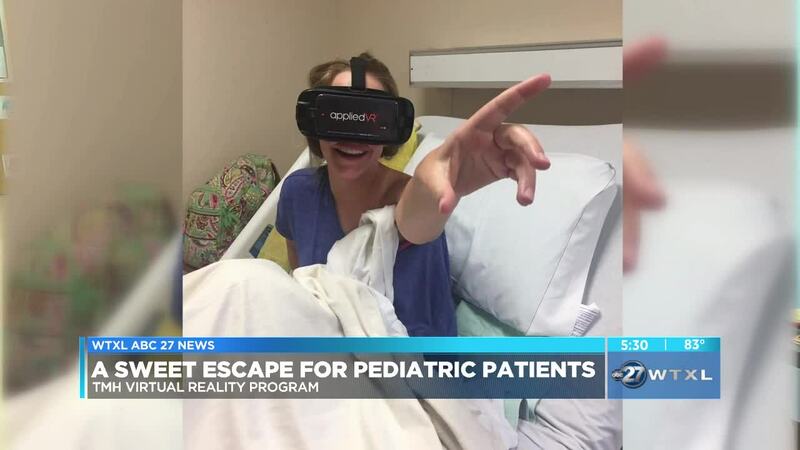 "I still tell kids exactly what's going to happen but they don't always want to watch so giving them virtual reality allows them to completely be distracted and block out what's going on," said Olivia Vincent, Certified Child Life Specialist at TMH. "If children have been here one, two, three months at a time they can use this to go to Iceland or London and it's like they're going out of the hospital without actually leaving the hospital." TMH offering a sweet escape from the kind of pain no child wants to remember. TMH is looking into expanding this applied virtual reality program to other parts of the hospital to help more of their patients.